As I was watching SmackDown! 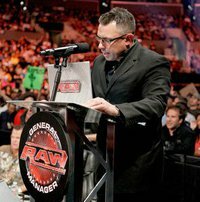 Saturday afternoon (on DVR) I came up with a new role for Michael Cole in the WWE. His promo with Jack Swagger made me realize that Cole would make a great heel manager. I posted last week about Jimmy Hart returning to the WWE. In that post, I suggest having Hart return to his managerial roots and work with a reunited Hart Dynasty. I'm a mark for old school and loved the days when managers were running around outside the ring and offering a voice for their men. So here's my plan. Cole and Jerry Lawler go ahead with their match at Wrestlemania. Cole throws out a stipulation prior to the match that the loser has to leave the announce team. Lawler fights the odds with the deck stacked against him and beats Cole. But before he can even celebrate, Swagger and Alex Riley lay a beating on the Hall of Famer. Cole joins the fray, telling the two superstars to destroy the King. At some point during Raw, Cole shows up. The King reminds him he's banned, to which Cole pulls a contact out of his pocket and reads it. He announces that he is no longer the voice of the WWE, but he will still be around. He has signed a deal to be a manager. Swagger and A-Ri come out and face the intimidating duo of Mark Henry and Yoshi Tatsu. Swagger and A-Ri destroy the twosome. Cole gets back on the mic and says he's building a stable of guys who have been overlooked and under appreciated long enough, and together they will take over the WWE. Slowly a couple of new guys are added to the mix. Maybe a heel John Morrison and Sheamus. This is just a rough idea of my plan. It accomplishes 3 things. 1.) It gets Michael Cole off the broadcast team. 2.) It helps with my plan of restoring managers. 3.) It gives us a new tag team (Swagger & Riley) that I think could work well together. Thanks for reading, be sure to check out My 1-2-3 Cents on YouTube, and we've also created a Facebook page too. We'll be posting wrestling photos, news updates, and other thoughts there. FREE WWE Monday Night Raw Live Stream Online Game March 7 2011. Watch Live WWE Monday Night Raw Stream Online Free – March 7 2011 (03.07.2011).